Could the rapper's long-awaited debut album finally be on the way? Jay Electronica has heightened the hopes of fans with a preview of what sounds like material with Swizz Beatz. The rapper shared a video on Instagram, tagging Swizz, and playing an instrumental which seems to feature the producer's voice. We don't hear any bars from Jay Elec in the clip, but the intention here seems fairly clear, especially given his recent declaration that he would be dropping music in the near future. 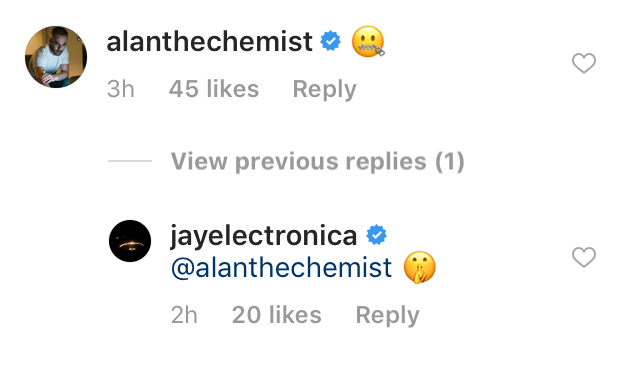 In the comments section of the post, producer the Alchemist commented an emoji with a zipper mouth, suggesting he knew something about the impending music that fans do not. Jay Elec responded with a "shh" emoji, playing into the mystique around the preview. Could the two have worked together on something we'll hear soon? For now, we'll just have to wait and see what happens.